Evelyn joined SEG in the 1980s and she belonged to the Nimble Thimbles Guild at Cut Knife, which began in 1978. She was originally from Rockhaven, Saskatchewan, a smaller community near Cut Knife. Evelyn is no longer stitching but it's great that we have this reminder of her and her favourite type of needlework. This is a great idea for using up scraps. I really like some of the combinations and layout. 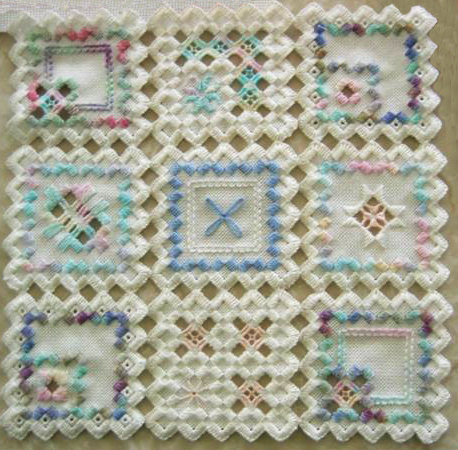 What a lovely piece of hardanger! 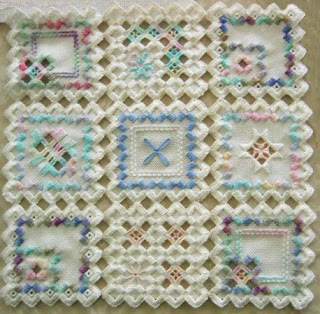 I love the variety of stitches and threads used.